Mist eliminators (also called droplet eliminators, droplet separators or demisters) are devices that can remove liquid droplets from a gas flow. The gas flow laden with droplets is forced to pass through different channels, changing direction in a repetitive manner. Wave-plate (or vane type) eliminator are widely employed in chemical and industrial processes involving gas and vapour flows where mist removal is necessary for several reasons. For instance, one of the most important objectives is to restrict pollutant emission into the environment, as in cooling towers applications. Wave-plate mist eliminators can operate in vertical and horizontal situations, but in both cases, the removal of liquid droplets occurs mainly by inertial impaction. In cooling towers, spraying water is distributed over a heat transfer surface across or through which a stream of air is passing. Thus, water droplets can be captured by the stream of air and they will be carried out of the system. This phenomenon is known as drift. In countries with warm climate, inside the cooling towers the conditions of high temperature and humidity can strongly induce the spreading of pathogens agents, especially the Legionella pneumophila. The main disadvantage of installing mist (i.e., drift) eliminators is an increased pressure loss of the airflow. High-pressure loss contributes to lower flow rate of air or higher engine power of the ventilators. This fact leads to obtain lower overall efficiency values for the air-conditioning systems. 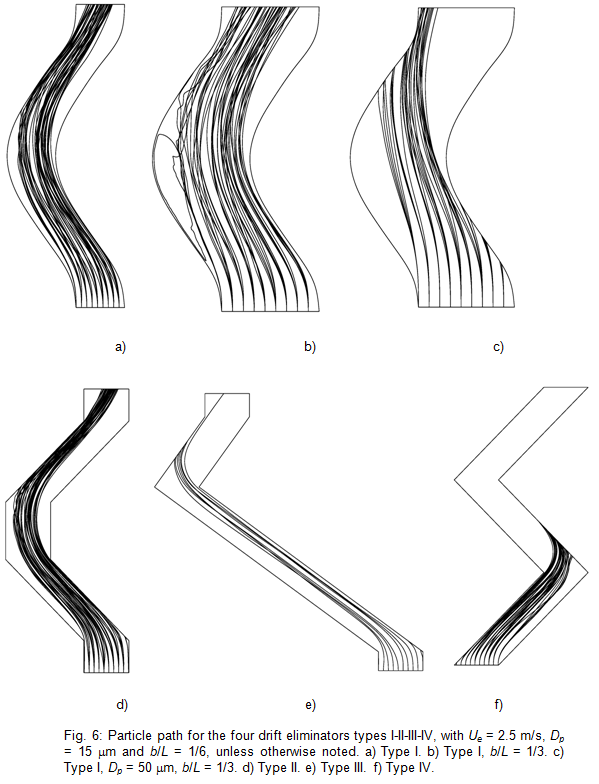 Since a lack of systematic studies on comparative evaluation of morphologically similar separators has been detected, the behaviour of four wave-type eliminators having a similar geometry is studied. Both droplet collection efficiency and the pressure drop coefficient are calculated. Special emphasis is made on the validation of the numerical model with results taken from the literature, the study of the effects of relevant parameters, and the achievement of a procedure to evaluate the overall efficiency of each regarded type of eliminator. 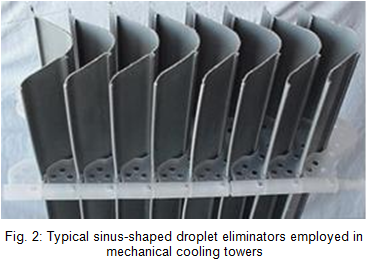 The obtained results may contribute to improve the passive droplets restraint systems in mechanical cooling towers, increasing the overall operation of the cooling tower on one side, and lowering their environmental impact on the other. Authors have presented numerical results for the drift deposition from a mechanical cooling tower, located in an urban environment (Campus of the Universidad Miguel Hernández de Elche, southeast of Spain). Some of the results obtained are presented in Hernández et al. (2009). It can be observed in Fig. 1 that the urban environment is simulated in order to obtain realistic simulations. The numerical results are compared with those obtained experimentally. The experimental facility includes a cooling tower of small size (Fig. 1), with commercial droplet eliminators such as that shown in Fig. 2. Most of the numerical simulations are carried out by using Ansys-Fluent code, which employs a finite volume method. Some additional results are obtained with Phoenics code. Both Ansys-Fluent and Phoenics codes are enough validated, commercial CFD (Computational Fluid Dynamics) codes. For the dry-air flow, the Reynolds-averaged steady governing equations are numerically solved in a Eulerian reference frame. Additional equations for the dispersed phase (spherical water droplets of Dp diameter and velocity Up), are solved in a Lagrangian reference frame, consist of the force balance over the particle and the corresponding trajectory. The dispersion of particles due to turbulence in the continuous phase is simulated using a stochastic tracking model (discrete random walk model in Ansys-Fluent). By computing the trajectory for a sufficient number of representative particles ('tries'), the random effects of turbulence on the particle dispersion may be simulated. With regard to the boundary conditions, the interaction between particles and solid walls deserves a detailed attention. It is a complex phenomenon, well described in the literature. The interaction can be stated from the calculation of the droplet impact energy, as a function of the Weber number, We. This phenomenon can result in the bouncing, sticking, spreading or splashing of the droplets. In Kaiser et al. (2009), a satisfactory comparison withthe limit proposed by Mundo, Sommerfeld and Tropea can be found; in Fig. 3, KMundo = (Oh)(Re)1.25, being Oh the Ohnesorge number, and Re the Reynolds number, with the relationship Re = We1/2/Oh. 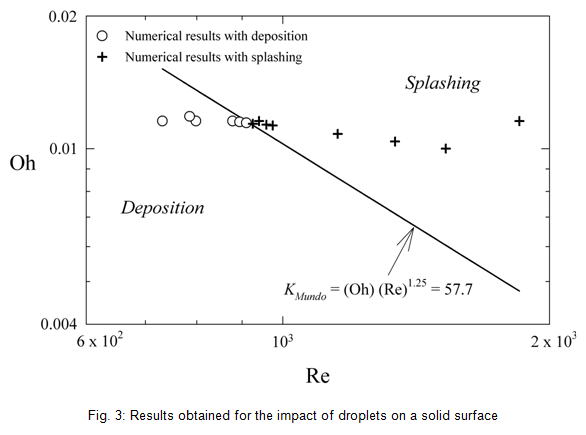 This limit establishes the separation between the splashing and the deposition (spreading, sticking) of droplets impinging over a solid surface. Once the above test was successfully performed, since our main objective is to calculate the droplet collection efficiency, it is assumed that the interaction of droplets with the wall is that the wall traps the droplet when the droplet contacts the wall. The droplet collection efficiency h (or removal efficiency) can be defined as the ratio between the mass flow rate trapped in the eliminator and the incoming total mass flow rate (Kaiser et al., 2009; Zamora and Kaiser, 2011). In order to validate the obtained results, numerical simulations are carried out considering different types of mist eliminator previously studied by several authors. Figure 4 shows the particle path obtained for a wave-plate mist eliminator with drainage channels. It can be concluded that the comparisons with results taken from literature were successful (Zamora and Kaiser, 2011). Type I. Sinus-shaped (also called Belgian wave), Fig. 6a, b and c.
Type II. Three-segment (also called H1-V), Fig. 6d. Type III. L-shaped, Fig. 6e. Type IV. Zig-zag, Fig 6f. To compare the relative eliminator performance in terms of droplet collection efficiency, the pitch length and the longitudinal length are fixed for the regarded separators, b = 0.0125 m and L = 0.076 m respectively, being the inlet and outlet sections geometrically periodic. Thus, it is assumed that the behavior of a complete separator device is mainly the same that a sample channel one. The aspect ratio b/L of the reference sample channel is b/L = 0.0125/0.076 ≈ 1/6. The influence of b/L is investigated by considering the additional values b/L = 0.0250/0.076 ≈ 1/3 and b/L = 0.00625/0.076 ≈ 1/12. The range of the considered droplet diameter is 2 x 10-6 ≤ Dp ≤ 50 x 10-6 m. The regarded values of the inlet velocity of the airflow are Ue = 1, 1.5, 2, 2.5, 3, 4 and 5 m/s, leading to obtain a roughly range of Reynolds number Re = 650 - 8,500. The inertial parameter Pi , i.e., the Stokes number (function of Dp and Ue , as well as physical properties of air and water) are roughly in the range 0.05-2.5. In Zamora and Kaiser (2011), a systematic study to assess the influence of using two different turbulence models, including or not the turbulent dispersion of droplets is carried out. A global correlation for the collection efficiency as a function of the inertial parameter Pi is presented. 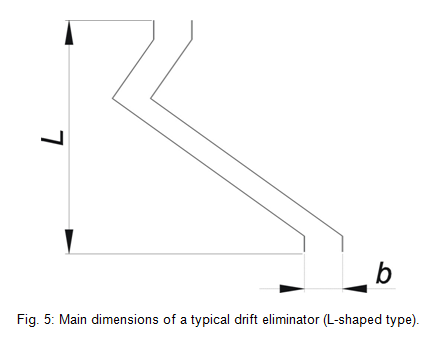 The morphology of each eliminator is characterized through a non-dimensional parameter introduced in the aforementioned work, the removal geometric parameter, which involves the influence of the wet walls lengths and the longitudinal dimensions of walls, as well as the number and the amplitude of the centerline direction changes (i.e., bends) of the eliminator sample channel. In addition, a procedure to evaluate the overall performance of each of the regarded four eliminators types has been developed, through the calculation of a key function related to the required fans power, obtained from the relevant parameters of the problem (inertial parameter, pressure drop coefficient and Reynolds number). Under given conditions, it can be concluded that the type IV (Fig. 6f) is the most appropriate (Zamora and Kaiser, 2011). It can be stated that the simulation with CFD is an adequate tool to analyze the regarded problem, but it is necessary to study the influence of the considered domain and the fineness of the mesh. It is clear that there are inherent inaccuracies in any numerical simulation, due solely to the fact that a discrete approximation is used to simulate a continuous problem. With regard to the processes of verification and validation, it can be summarized that verification is the process of solving the equation right, while validation is the process of solving the right equations. Although it can be assumed that codes such as Ansys-Fluent (employed in this work) are sufficiently verified, it is mandatory to validate the numerical simulation. In Zamora et al. (2011), an uncertainty analysis in the numerical simulation of the regarded air-water droplet motion is carried out. In the above work, on the one side, in order to minimize the numerical uncertainty, the sensibility of the obtained results in terms of different interpolation schemes and turbulence models is analyzed. On the other side, the GCI (Grid Convergence Index method, recommended by ASME) for estimating the numerical discretization uncertainty, supported by the analysis of the influence of the non-dimensional distance to wall y+, revealed as satisfactory to obtain realistic results. Finally, another relevant conclusion pointed out in the aforementioned work is the fact that to avoid excessively large computational cost, grids built with not too low values of y+ should be chosen; this leads to achieve sufficient accuracy, but with the constraint in obtaining a reduced uncertainty. In Zamora and Kaiser (2012), a detailed analysis on the influence of different numerical schemes and procedures is presented. 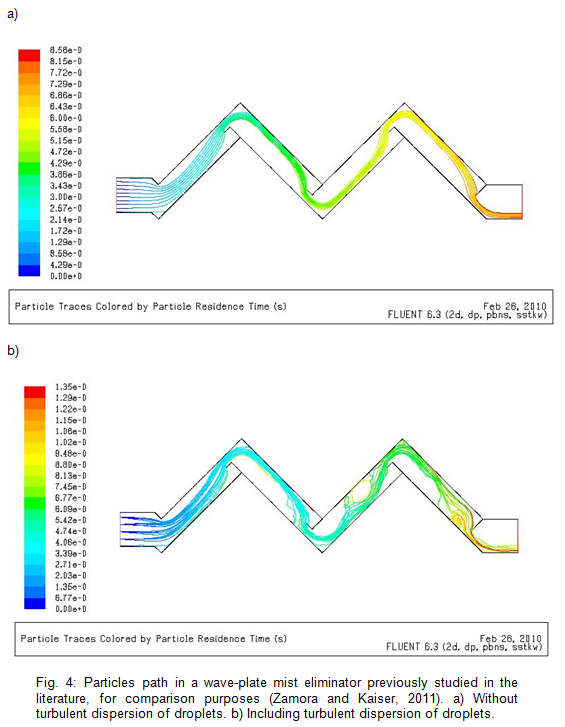 The turbulence is simulated alternatively employing the turbulence models k-e, k-w and the Reynolds stress model, with low-Re version and wall enhanced treatment refinements. The results obtained are compared with numerical and experimental results taken from the literature. The degree of accuracy obtained with each of the considered models of turbulence is stated. The influence of considering whether or not the simulation of the turbulent dispersion of droplets is analyzed, as well as the effects of other relevant parameters on the collection efficiency and the coefficient of pressure drop. Results reached alternately with Ansys-Fluent and Phoenics codes are compared. The best results correspond to the simulations performed with Ansys-Fluent, using the SST k-w turbulence model, with values of the dimensionless scaled distance to wall y+ in the range 0.2 to 0.5. Finally, correlations are presented to predict the conditions for maximum collection efficiency (100 %), depending on the geometric parameter of removal efficiency of each of the separators. KAISER, A.S., ZAMORA, B., HERNÁNDEZ, M., LUCAS, M. and RUÍZ, J. (2009). Simulación numérica del flujo de aire y del impacto de gotas dispersas sobre los separadores de una torre de refrigeración, Congreso de Métodos Numéricos en Ingeniería 2009, SEMNI, Barcelona, Spain. ZAMORA, B. and KAISER, A.S. (2011). Comparative efficiency evaluations of four types of cooling tower drift eliminator, by numerical investigation, Chemical Engineering Science, 66: 1232-1245. ZAMORA, B., KAISER, A.S., KLING, U., LUCAS, M. and RUÍZ, J (2011). Uncertainty analysis in the numerical simulation of the air-water droplet motion through drift eliminators, ASME Journal of Fluids Engineering, 133: 094501-1/6, DOI: 10.1115/1.4004762. regarding the results published in this bulletin should be solicited to the corresponding author. do not necessarily reflect the official view of the Universidad Politécnica de Cartagena. Copyright © 2019 Bulletin. All Rights Reserved.